Chinese-American Oceanic Atmospheric Association Southern California Chapter (COAA SCC) held a successful Chinese New Year party on Feb 20, 2010 in Alhambra, CA. This was the fifth annual Chinese New Year celebration organized by COAA SCC. Near 80 scholars and their families attended this joyful event. The party began with a warm welcome remark by Prof. Jin-Yi Yu (UCI), Chair of COAA SCC. Prof. Kuo-Nan Liou (UCLA) gave an inspiring speech of the Year of Tiger. Prof. Yuk Yung (Caltech) presented his Chinese poems and a beautiful Chinese calligraphy by his wife, Ms Yi Li. 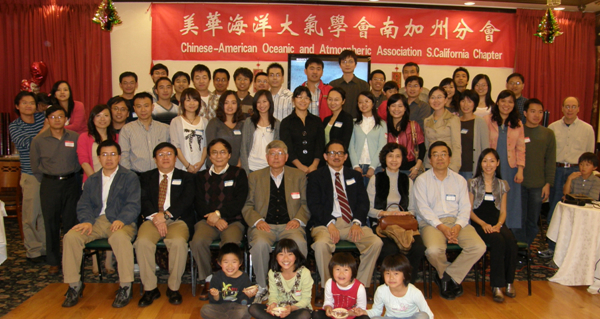 (poems posted at https://coaascc.wordpress.com/2010/01/26/a-poem-from-prof-yuk-yung/) Prof. Yongkang Xue (UCLA), the ex-Chair and founder of COAA SCC, talked about the history of COAA SCC and presented interesting historical photos from previous events. Prof. Yu also read a New Year greeting from Dr. Lee-Lueng Fu (JPL). Prof. Yu then acknowledged the 2009 Executive Committee (EC) and the retiring EC members for their great work and contribution. Ex-Chair Prof. Yongkang Xue, ex-Secretary Dr. Hui Su (JPL), and ex-Treasury Dr. Yu Gu (UCLA) received service award certificates from COAA SCC. Prof. Yu then introduced the 2010 EC and the newly-elected EC members, followed by a brief and warm speech by Vice Chair, Dr. Yi Chao (JPL). Prof. Qinbin Li (UCLA and JPL) presented the first invited talk entitled “Life after the PhD”, which received great feedback from graduate students and young scientists. He talked about building career path through various approaches and answered questions that many students are having in their minds while pursuing PhD. Dr. Carol Hsu, an expert in realty, presented the second invited talk on “Real Estate Opportunities and Strategies”. Both COAA SCC members and families enjoyed her talk and the “secret strategies” she brought us. Our institution representatives, Dr. Xianwei Wang (UCI), Junhong Liang and Yizhe Bu (UCLA), Dr. Hong Zhang (JPL-Ocean), Dr. Shuhui Wang (JPL-Atmosphere, ARB, USC), and Le Kuai (Caltech) introduced members in each institution. This has been a great tradition of COAA SCC Chinese New Year Party, through which new members make more friends and old friends and colleagues are brought closer. The party concluded after Minhui Lo (UCI) gave a visual tour of new COAA SCC website (https://coaascc.wordpress.com). The new website is user friendly and offers an active platform for members and friends to exchange information. In between the presentations, prize drawings were conducted (coordinated by Dr. Shuhui Wang), which brought more excitement and laughter to this successful party and happy gathering.